Powers/Abilities: Morgan Sinclair had above average skill in hand-to-hand combat and was experienced with firearms; she was was also expert in structural engineering. (Punisher II#64 (fb) - BTS) - Sinclair became the engineering supervisor of the construction of the English Channel Tunnel (Chunnel). She did not realize that her employer, Wilson Fisk, was actually the American Kingpin of Crime, who sought to use the Chunnel to unite the European criminal organizations into one large network with himself at the lead. (Punisher II#64) - In Paris, Sinclair discovered unauthorized men working in the Chunnel. When she confronted them they revealed themselves to be agents of the Kingpin, and Snakebite then appeared and took her hostage as he was being pursued by the Punisher. (Punisher II#65) - Morgan scratched at Snakebite in an effort to escape, but he slapped her unconscious. When Parisian authorities arrived, they arrested her along with the similarly unconscious Punisher. In prison, a prison guard (in Fisk's employ) prepared to sexually assault and kill her, but Castle awakened in time to save her and help her break out. Morgan revealed that she had managed to obtain a list from Snakebite during her struggle with him. The list detailed the names of several European criminal organization lieutenants, who were to be Snakebite and his allies' targets. Morgan and the Punisher started by heading to her uncle Phillipe Delon's villa in Vosges, Western France, where they found that Snakebite and company had already completed their mission. They were then attacked by Snakebite and Rapido, but managed to make it back to their helicopter, where Batroc ambushed the Punisher. Morgan shot Batroc with her automatic weapon; protected by kevlar, he survived the gunshots, but was stunned long enough for she and Castle to flee by chopper. Snakebite's pilot, Chauffard shot out their tail rotor, and they crashed into the trees below. (Punisher II#66) - Recovering, Sinclair and Castle headed to the Schwartzberg Hunting Lodge, Rottweil, Germany where they hoped to locate Klaus Baumer, the next lieutenant on the list. Instead, they encountered the Bear, a Romanian Racketeer who sought to exclude the Kingpin from the European crime network, who had killed and replaced Baumer. The Bear took Morgan hostage and sent Castle out into the Black Forest to try to escape his hunters. Snakebite arrived, shot the Bear, and left a bomb to destroy the Lodge. The Bear, too, survived by wearing kevlar, but Castle returned, slew the Bear, and disposed of the bomb. (Punisher II#67) - In Geneva, Switzerland, Snakebite attempted to kill the Italian and Swiss lieutenants when they had a meeting. Sinclair scattered the targets, allowing the Italians to flee. She and Castle managed to save the Italian lieutenant, Ginellie, and temporarily stop Snakebite and his allies. 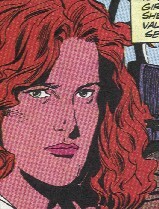 Ginelli led Castle and Sinclair to his back-up, where Castle hoped to enlist their aid in foiling the Kingpin's plan. However, they were instead ambushed by the Tarantula, an Enforcer for the Spaniards' criminal organization. (Punisher II#68) - The Tarantula brought Sinclair, Castle, and Ginelli to Northern Spain, to his employer, Paco Cardenas, who also happened to be an old family friend of Sinclair. Cardenas freed Morgan, who attempted to explain the dangers that approached them. Cardenas was skeptical, until Snakebite's forces arrived and assaulted his ranch. He was slain seconds later by his nephew, Miguel, a matador secretly loyal to the Kingpin. Morgan held off Batroc with a gun, and when the Punisher caused a stampede of bulls, the Tarantula carried her to safety. Morgan then piloted the plane that flew she, Castle, and the Tarantula to safety. (Punisher II#69) - Back in London, Sinclair, Castle, Microchip, Outlaw, and Tarantula made plans to assault the Kingpin's meeting with the heads of the European crime syndicates in the Omni Tower. The Kingpin's plan was to assassinate these leaders, and--as the lieutenants were out of action, too--replace them with men the Kingpin had strategically placed, granting Fisk control of the pan-European Syndicate. Morgan was present at the reception, using her cover as an employee of Transmache, and then infiltrated the building's security system and neutralized it with the guidance of Micro. Snakebite slew many of the crime lords and fled, but Morgan confronted him at gunpoint. (Punisher II#70) - Snakebite popped his guns out and shot Sinclair, but was then assaulted by a furious Punisher. Snakebite managed to skewer Castle in the shoulder and knock him off the roof onto a grate. As he cut the grate's supports, Sinclair smashed into him from behind, knocking him down on the grate as well, where he met his death. Sinclair went to the hospital while the rest of her allies fled the authorities, but she was later visited by Outlaw. The two agreed that they had had more than enough of the violent life. (Punisher Annual#7) - The Architect allied himself with Rapido and Chauffard and attempted to reprise the Chunnel plot to take control of the European crime network. Under the direction of Castle, Morgan faked her death at the hands of Rapido (she used concealed scuba gear to fake drowning when he flooded the tunnel in which she was working). Later, she, Castle, Microchip, Jack Oonuk, and Outlaw showed up at the opening ceremony of the Chunnel. Morgan shot and killed Chauffard as he attempted to run her down in his car. Comments: Created by Dan Abnett, Andy Lanning, and Dougie Braithewaite.